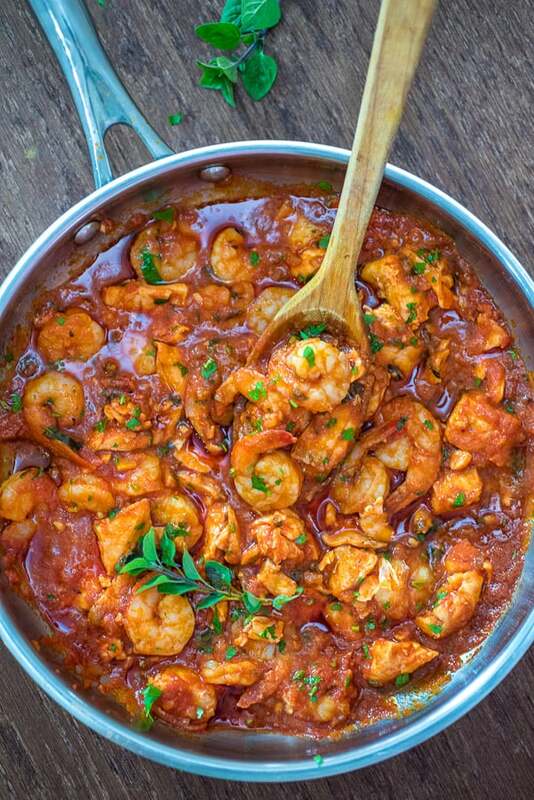 Salmon fillets and shrimp cooked in a tomato sauce with onions, garlic, and fresh herbs. 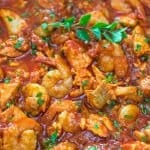 This Italian Fish Stew makes an easy and scrumptious dinner, and comes together in less than 30 minutes. 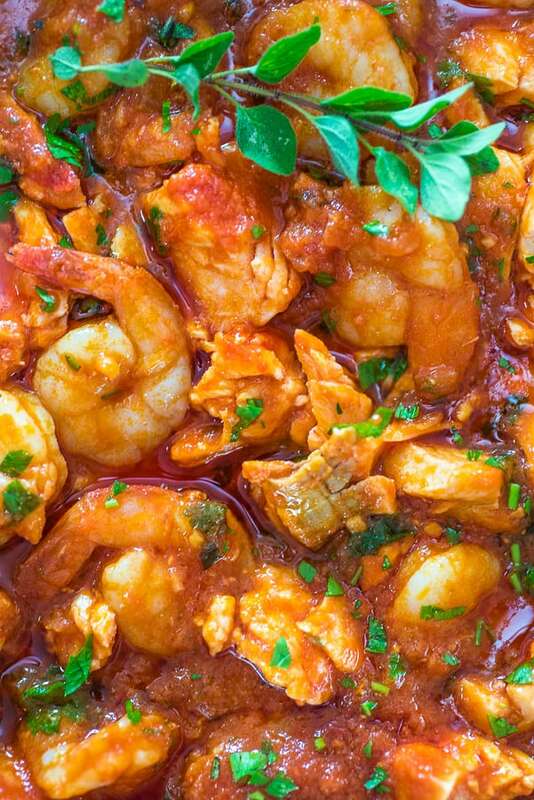 This Italian Fish Stew is one of my favorite ways to cook seafood. It is very versatile, and almost any kind of seafood could be used here. Today, I made it with salmon and shrimp – a perfect duo! I also love that even though it’s very filling and hearty, it is still a fairly light meal that can be enjoyed with so many different sides. Once you try this recipe, I am sure that it’ll become a staple at your home. Some of you might not be familiar with clam juice, and may never have cooked with it before. Clam juice is just the broth obtained from clams. It is made from the liquid used to steam fresh clams. Bottled or canned, clam juice is sold in nearly every supermarket, usually in the canned fish section. Similar to fish broth, it makes a great addition to many seafood dishes and soups, and it’s worth it to keep a few bottles in your pantry. If you prefer the convenience of online shopping, you can buy clam juice from my favorite Thrive Market, or on Amazon.com. 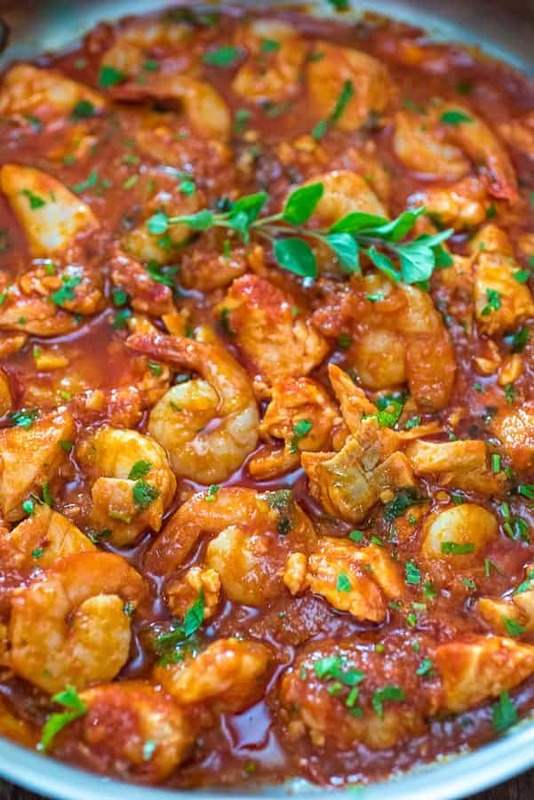 As I mentioned above, many kinds of seafood can be used in this Italian Fish Stew recipe. Fish. 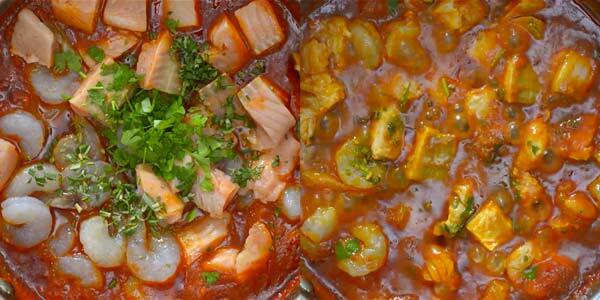 The stew works best with salmon, halibut, cod, red snapper, and tilapia fillets. Shellfish. 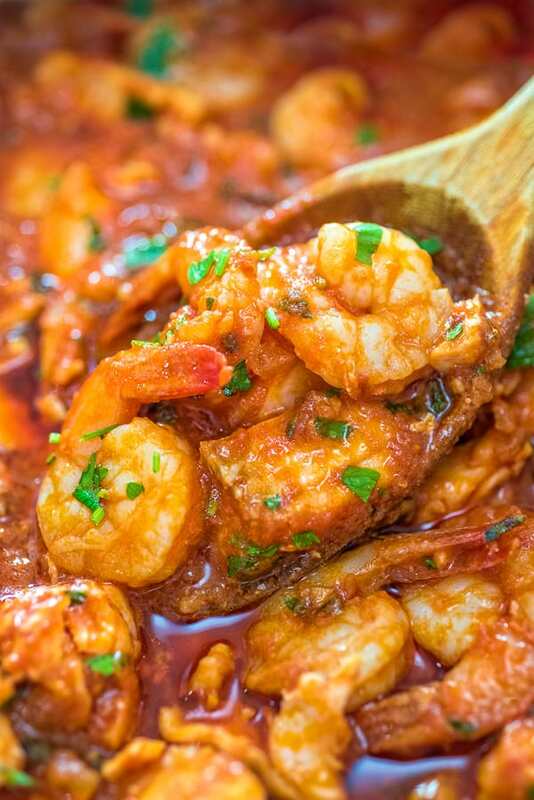 I have tried using shrimp, clams, mussels, and scallops in this recipe. I bet it would also work with lobster, crab, and crawfish meat. 1. Heat the olive oil in a large skillet over medium-high heat. Add the onion and sauté for 4-5 minutes, just until it softens and cooks through. 2. 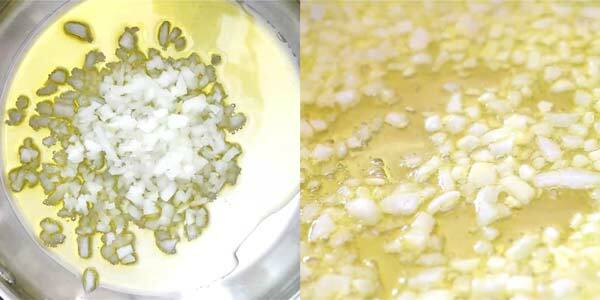 Add the garlic, anchovy fillets, and red pepper flakes to the onions and cook for 1 minute. 3. Add the tomato sauce and clam juice and bring to a boil. Reduce the heat to medium-low and cook for 10 minutes. 4. Add the salmon pieces, shrimp, chopped herbs, and salt. Stir gently. Cook for about 5 minutes, or until the seafood is cooked through. 5. Garnish with fresh herbs. Serve. Grains. This stew tastes great with a side of rice, couscous, or quinoa. 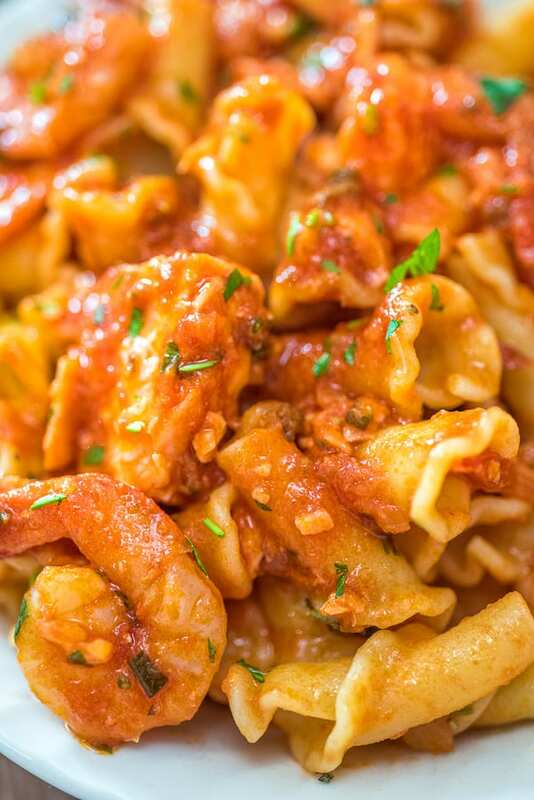 Pasta. You can also add some pasta and stir it right in. Veggies. Steamed broccoli, green beans, asparagus, or cauliflower will make a great side. Bread. You can just serve the stew in a bowl with a slice of crusty bread. Heat the olive oil in a large skillet over medium-high heat. Add the onion and sauté for 4-5 minutes, just until it softens and cooks through. 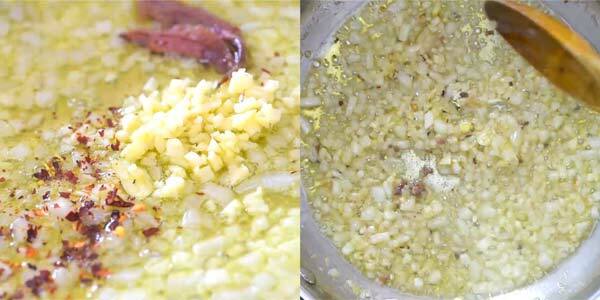 Add the garlic, anchovy fillets, and red pepper flakes to the onions and cook for 1 minute. Add the tomato sauce and clam juice and bring to a boil. Reduce the heat to medium-low and cook for 10 minutes. Add the salmon pieces, shrimp, chopped herbs, and salt. Stir gently. Cook for about 5 minutes, or until the seafood is cooked through. Garnish with fresh herbs. Serve.